Buon Natale! 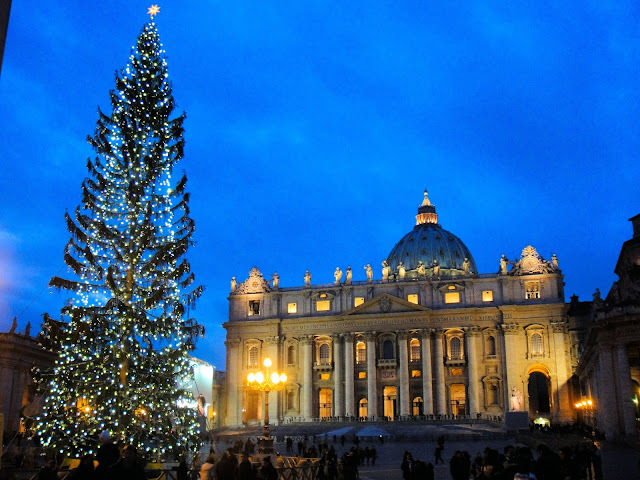 Christmastime at St. Peter's in Rome, Italy. Photo: RomeCabs.com. Unauthorized use is prohibited. In Search of Christmas in Europe brings us to Italy my friends and with that, I wish you Buon Natale! We'll celebrate the time-honored traditions and customs enjoyed by Italians who know a thing or two about celebrations! We'll send letters to Babbo Natale (Father Christmas), gather with Italian families as they set up elaborate presepi (Nativities), and then feast with them on Christmas Eve. From Advent to the Epiphany, there's an Italian celebration for just about every day in between and we're going to join the festivities; plus hear a few tips from some of my good friends as well. Andiamo and let's celebrate Buon Natale! 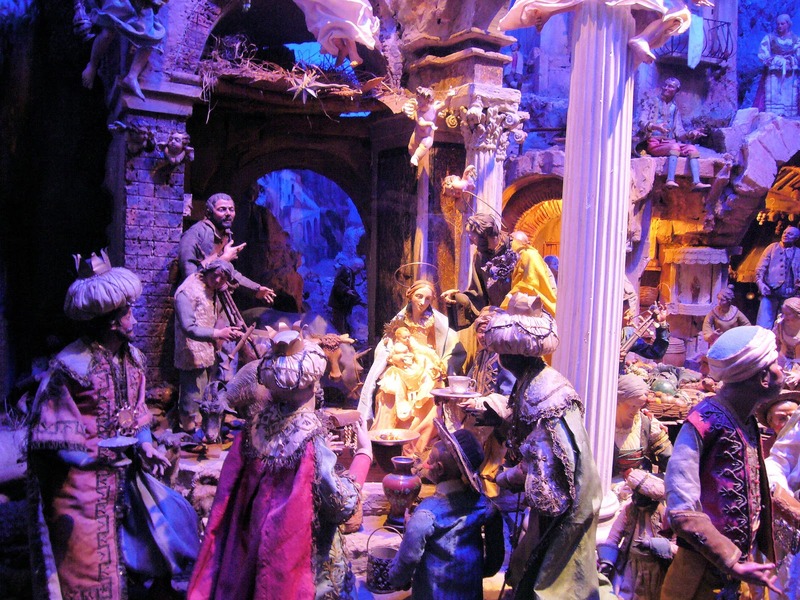 The Creche holds a prominent place in many an Italian home at Christmastime. Photo: ©Guillaume Piolle. 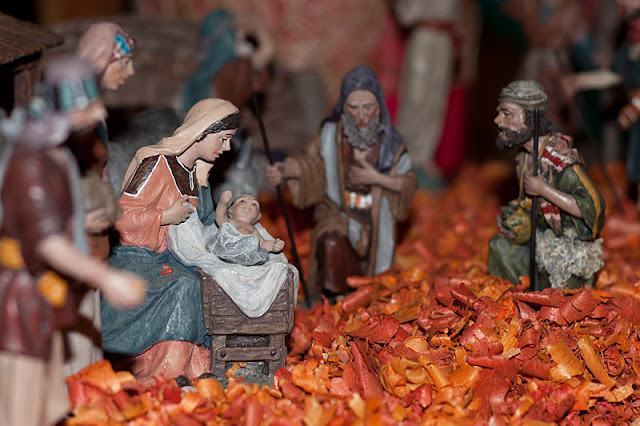 Topping the list of Italian family traditions is the annual ritual of setting up the family presepio (manger). Actually this custom dates back to the 17th century when Roman aristocracy began to construct elaborate Nativities within their homes for the first time. Centuries before, Nativities were mostly found in churches and monasteries only. Today, the Nativity or Crèche holds a prominent place in most Italian homes with the tradition and heirlooms passed down from generation to generation, plus a few new additions each year. But it is at midnight only on Christmas Eve when the Baby Jesus is placed in His manger. Where to find the Presepi? 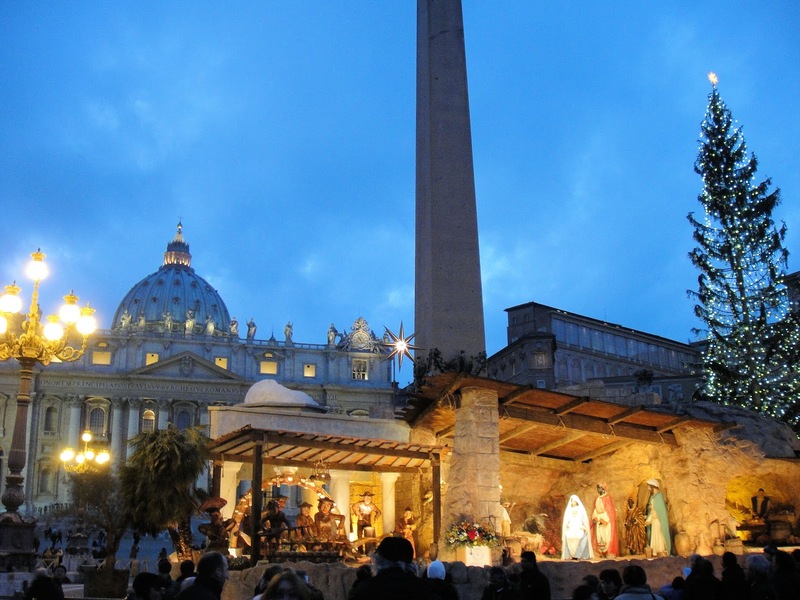 One of the most famous Nativity scenes is in St. Peter's Square in Rome. Photo: RomeCabs.com. Unauthorized use is prohibited. 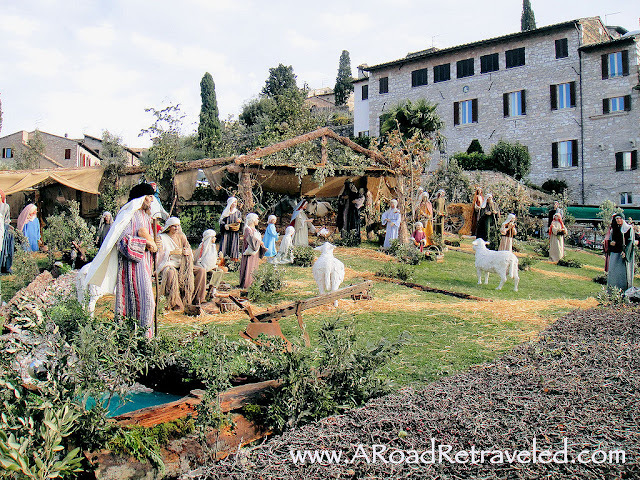 If you're planning to spend the holidays in Rome, be sure to visit Piazza San Pietro or St. Peter's Square where you'll find a life-sized manger where the Babe is placed after the Christmas Eve Mass and procession. If you're near the Roman Forum, seek out Santa Maria Maggiore near the Rome Termini train station where five wooden planks believed to be from the original manger are on display. Also, at the end of the Roman Forum adjacent to Piazza Campidoglio, Santa Maria in Aracoeli (St. Mary of the Altar of Heaven) has become a major pilgrimage sight—for inside, resides the Gesù Bambino or Santo Bambino—a wooden Baby Jesus carved from an olive tree born of the Garden of Gethsemane. It is believed that He has miraculous healing powers. Christmastime presepio in Assisi, Italy. Photo: ARoadRetraveled.com. Unauthorized use is prohibited. 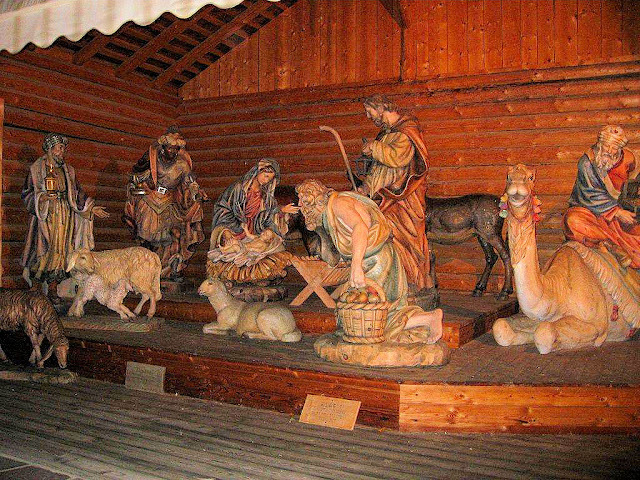 The largest wood-carved Nativity scene can be found in Santa Cristina in the Dolomites. Photo: Kari Moers of Pencarrow. Unauthorized use is prohibited. Up north in the Dolomites, behold the largest hand-carved wooden Nativity in Santa Cristina—an Alpine village renowned for its ANRI (German-made wooden figurines). Neopolitan presepio in San Gregorio in Naples, Italy. Photo: WikiMedia.org. Finally, if you're visiting down south near Naples, head to San Gregorio Armeno where you'll find permanent presepi plus an entire street of artisan workshops filled with craftsmen who build them throughout the year. Check out NapoliUnplugged.com for a great article and list of all the not-to-missed Presepi—"In Search of the Neopolitan Presepi." 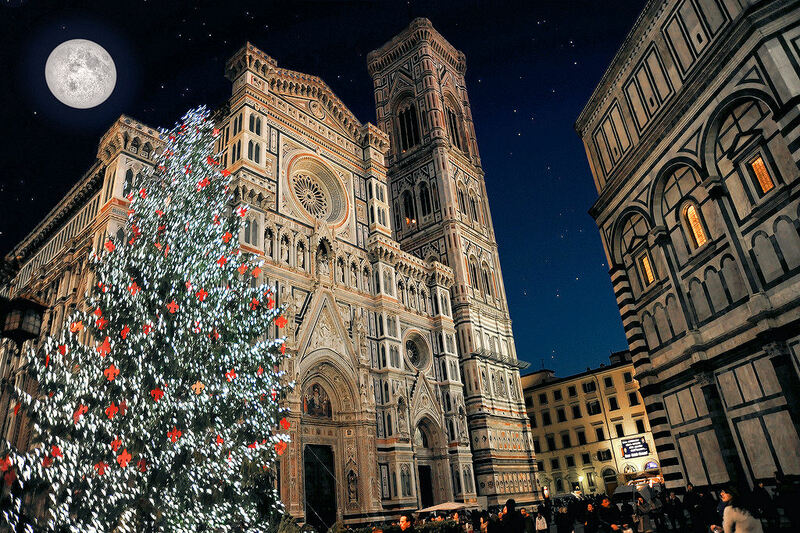 Christmas at Santa Maria del Fiore in Florence, Italy. Photo: Any Color You Like. One of my dear friends, Eugene from Florence, used to set out on a mission each year to seek out and find as many presepi as possible. Sounds like such a fun tradition and I wonder how many of you venture out in search of the presepi too? Share your story with me below. 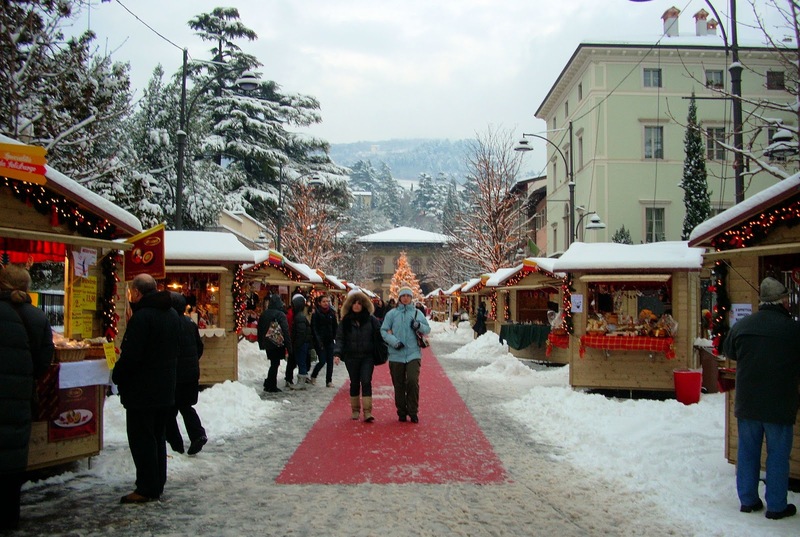 Mercantino di Natale or Italy's version of the Christmas Market in Rovereto, Italy. Photo: WikiMedia.org. Of course there are Christmas markets but it Italy, we call them Mercatino di Natale and although not as grand as their German brethren, these Christmas markets are just as festive nonetheless. From the enchanting Alpine towns of Trento and Torino to the historic city centres of Milan, Venice, Florence, Rome—among others, you will find Italians know a thing or two about Christmas markets too. Brimming with traditional Christmas trimmings, the Italians add a flavor of their own—among them are the piping hot Parampampoli—liqueur from Valsugana that's made with coffee, wine, sugar, grappa and honey; Nativity pieces of course; and something unique and mostly found in Rome—La Befana or the benevolent Christmas witch. You can find La Befana in her own market in Piazza Navona whose mercatino di Natale remains open through the Epiphany, but I digress and promise more on La Befana later. If you want a comprehensive list of the Italian Christmas Markets with all the times and information, visit ChristmasMarkets.com/Italy. 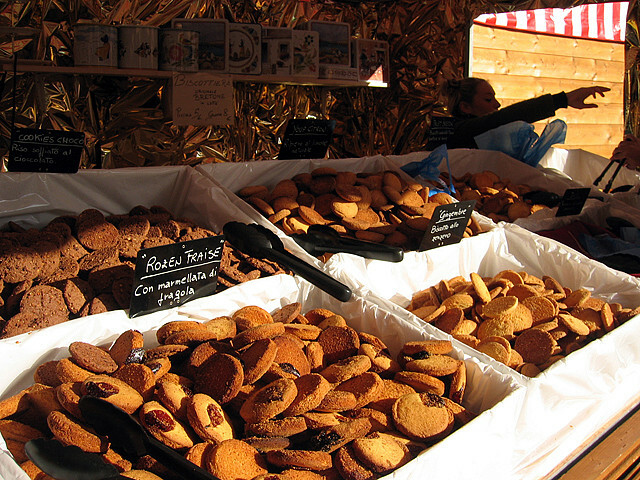 Just some of the delicious "goodies" at the Christmas Market in Florence. Photo: Kaye. Unauthorized use is prohibited. Another tip from my friend Eugene who recommends visiting the Christmas market in Piazza Santa Croce in Florence because of all the "goodies from the far North (sub-Tyrol, etc.) including mulled wine, krapfen, pretzels!" 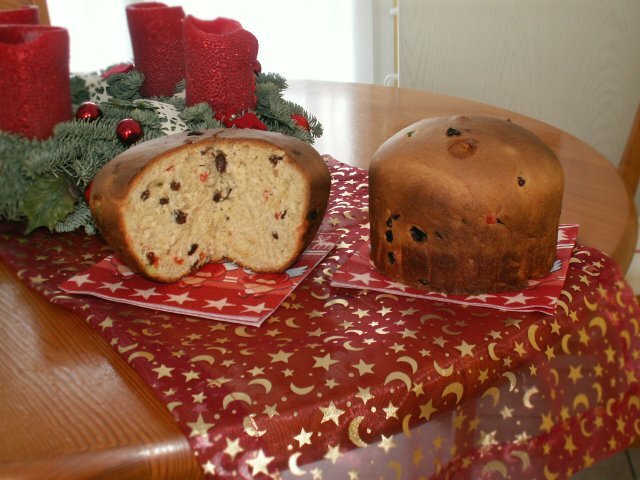 The Christmas Panettone or Italian fruitcake is common throughout Italy at Christmastime. Photo: WikiMedia.org. 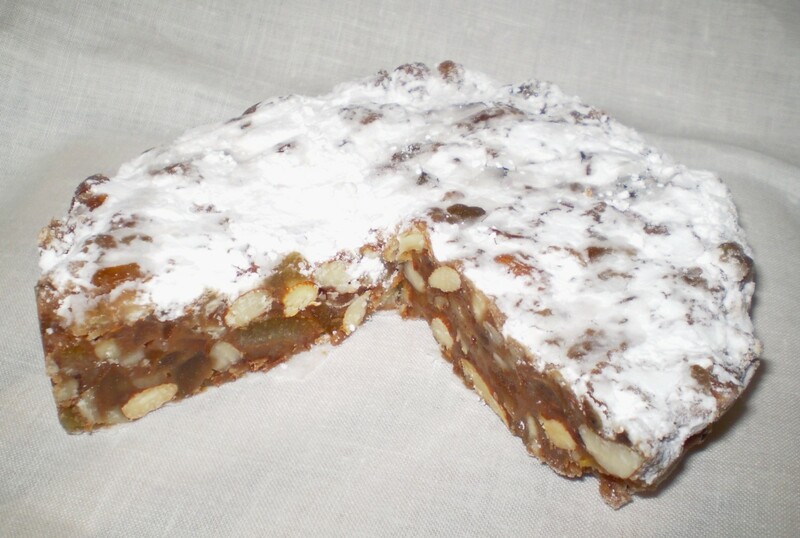 Throughout Tuscany, the panforte is the centerpiece of Christmas festivities and not only consumed by most who reside in the countryside, but also the object of a game in which the panforte is tossed around like a hockey puck or shuffleboard piece during parties and neighborhood gatherings in the piazza. As you can probably imagine, the cake is extremely dense and filled with nuts and berries. Plus it can last for weeks on end. Primarily, there are four varieties and depending on where you hail from in Italy, your panforte or variation thereof is bound to be the best. From Siena, it is the panforte (the strong bread) and simply no other. Move north to Milan, Tyrol and the Dolomites, friendly competitions ensue over the panettone (the big bread) or pandoro (the golden bread) in Verona. Finally, we have the pandolce (the sweet bread). With so many varieties to choose from, it is the panettone that is the most common throughout Italy and often given to those less fortunate during the holidays. There's one other treat that deserves mention—the torrone or nougat, a hard and brittle confection made from whipped egg whites, honey, vanilla and almonds or walnuts. The Italian Panforte or fruitcake is more dense than the Panettone but looks just as scrumptious nonetheless. Photo: WikiMedia.org. 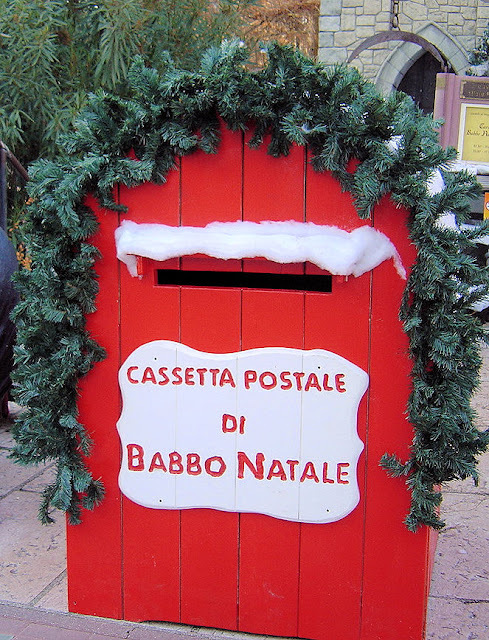 One of Italy's most enchanting traditions is the Babbo Natale or Santa Claus mailbox. Photo: Gardaland Magic Winter. One of the most enchanting traditions I have discovered in my search for Christmas and something I am certain is a thrill for all of the children of Italy are the little red mailboxes that magically appear in village squares. Gaining in popularity over the last few decades, these mailed boxes marked as "Cassetta Postale di Babbo Natale" promise delivery to Babbo Natale or Santa Claus at the north pole of course. One of my friends from TurinEpi.com told me that the Italian Postal Service delivers all letters addressed to Babbo Natale that are dropped in regular mailboxes as well. Another tradition that has survived since Pagan times and found mostly in the countryside is the Christmas Eve bonfire. Originally, Romans lit huge bon fires during Saturnalia or the winter solstice celebration to give thanks to Saturn, the god of the harvest, for their bountiful crops. Today, the bon fires survive and are lit on Christmas Eve, thus the "light of the flame" that burned for Saturn is now the "Light of the World" for our Lord. In some areas, residents erect giant wooden pyramids throughout their villages and on Christmas Eve, a processional winds around the streets with everyone celebrating the birth of the Baby Jesus. On December 8, Italy celebrates the Feast of the Immaculate Conception with a national holiday that really needs no explanation other than it is traditional for Italians to decorate their homes with the presepio and Christmas tree on this day followed by a scrumptious feast of course! Santa Lucia procession is led by one girl crowned with a wreath of candles or lights. Photo: WikiMedia.org. The Feast of Santa Lucia falls on December 13 each year and celebrations and traditions vary somewhat depending on where you live in Italy. But first, who is Santa Lucia (Lu-chee-ah), with the lovely sounding name? Saint Lucy is the Saint of Light and is long associated with the darkest days of the year and the winter solstice even though her celebration falls short of the actual solstice a week later. She is also the patron saint of the blind due to her martyrdom and the patron saint of Syracuse, Italy as well due to her miracle of famine relief in 1582. The feast of Santa Lucia is typically pasta with a special wheat dessert to pay homage to her miracles and martyrdom. 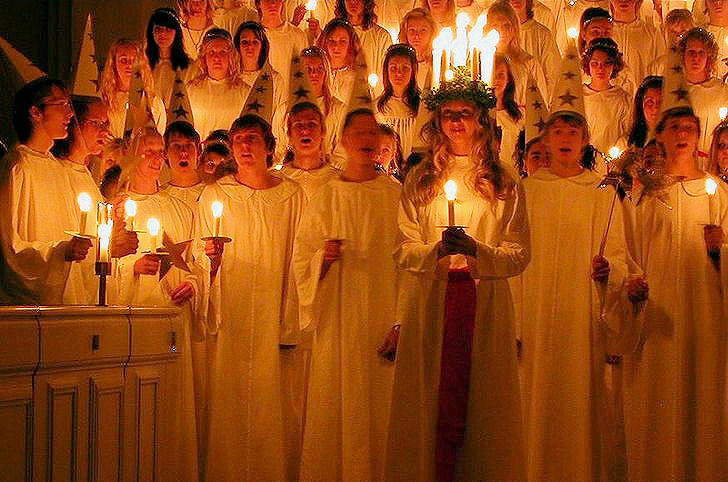 Following the feast is the Santa Lucia procession where one girl is crowned with a wreath of candles or lights and leads the procession of boys and girls, each carrying a single candle, in churches and throughout the villages as well. According to my colleague at TurinEpi.com once again, in northeastern Italy, children write letters to Santa Lucia who brings them gifts or coal depending on those who are naughty and nice! Christmas in Milan, Italy. Photo: Alessio Mesiano. Unauthorized use is prohibited. 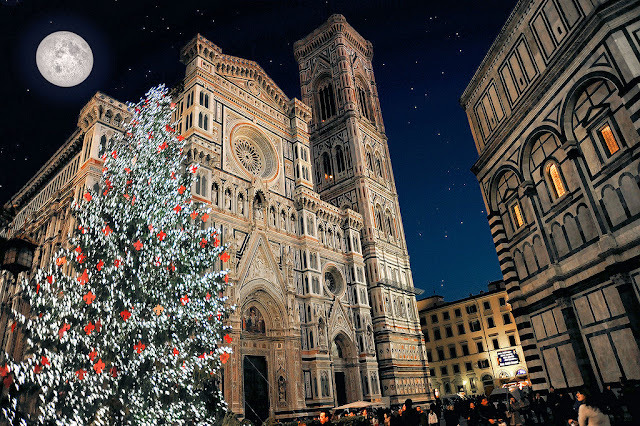 For many Italians, Christmas Eve is the highlight of the holiday—for it is the night of feasting, gift exchanging and attending midnight mass. However some Italian families still wait for Christmas day while others wait even longer for La Befana on the Epiphany. More on that later. Your typical Italian feast begins with antipasto and pasta; followed by the main course—traditionally Christmas Eel (must be the male eel) but many Italians indulge in seafood or the "Feast of the Seven Fishes;" and culminates with dessert and our beloved fruitcake. But what is makes Italian Christmas Eve unique is where the gift exchange takes place…not by the Christmas tree but at the presepio with the arrival of the Santo Bambino at midnight. Like the Italians, my family too celebrates Christmas on Christmas Eve and since I can't be in Rome on most Christmas Eves, the next best thing after the meal and gift exchange is watching midnight mass at St. Peter's in Rome followed by the procession of the Babe to His manger in St. Peter's Square beneath the Christmas tree. 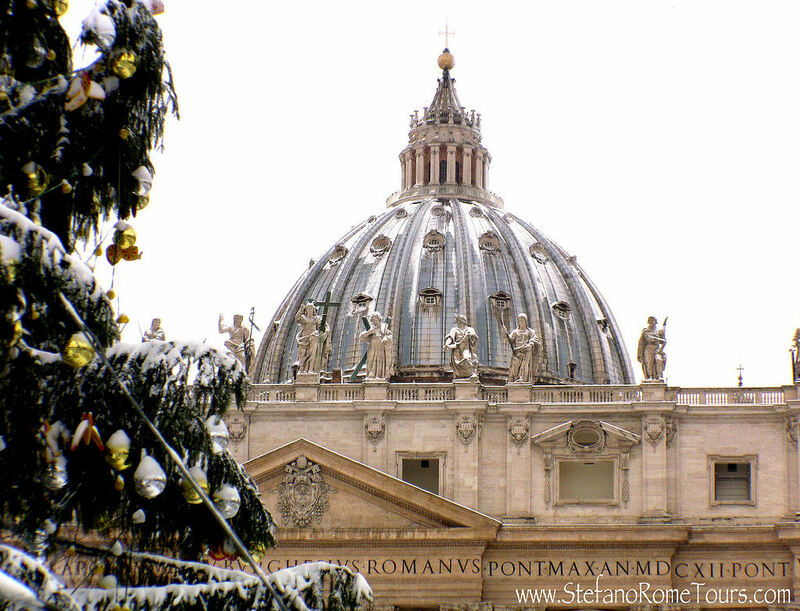 Christmas at St. Peter's in Rome, Italy, with Michelangelo's Cupola rising majestically in the background. Photo: ARoadRetraveled.com. Unauthorized use is prohibited. The Christmas Day feast is usually an extended lunch that lasts three to four hours at least whether you're dining at home or out in a restaurant. It usually include an elaborate meat dish accompanied by pasta or risotto, and let's not forget the variety of cheeses too. For dessert, stuffed panettone or pandoro with cream, espresso and a specialty liqueur to aid in digestion of all of that delicious food! Christmas market in the Piazza Navona in Rome, Italy, remains open till the Epiphany. Photo: WikiMedia.org. One of Italy's most beloved traditions and another day of gift exchange belongs to the "good witch of Christmas" or La Befana which means "gift bringer." According to legend, the Three Wise Men stopped by La Befana's home to ask for directions and request that she accompany them to Bethlehem. However, La Befana refused their offer only to regret it upon Christmas Eve when she noticed a great light shining in the night. Fully aware of her mistake, she gathered up bread and set out to Bethlehem in hopes of finding the Christ Child of Whom the Wise Men spoke. En route, she stopped by every baby boy along the way to offer some of her bread in hopes that one of the babies would be the Christ Child. To this day, she continues her quest to find the Baby Jesus and until that day comes, she brings gifts to all the children of Italy. On the eve of the Epiphany, you may just see her flying across Rome on her witch's broom with her sack full of toys for the good little girls and boys, and a sack of coal, actually a remarkable confection that shockingly resembles coal, for those naughty little ones. La Befana or the 'good' Christmas witch is one of Rome's most beloved traditions. Photo: ARoadRetraveled.com. Unauthorized use is prohibited. Here's a wonderful and festive video from my friends at WalksOfItaly.com showing us La Befana through the eyes of a child. One of my very good friends in Florence, Claudia of Artemisia Restauro, shared with me one of her favorite traditions that dates back to 1417, the "Festival of the Magi"—a procession that winds its way through the streets of Florence on January 6. Beginning at the Palazzo Pitti in the Oltrarno, it then crosses the Ponte Vecchio and meanders its way until finally arriving in the Piazza del Duomo where the Magi offer their gifts of gold, frankincense and myrrh to the Christ Child at Santa Maria del Fiore's Nativity in the piazza. From Advent to the Epiphany, we have celebrated much as I promised but there are so many more favorite traditions and customs practiced by the Italians every year at Christmas. What are you favorite Italian Christmas traditions? When do you celebrate, on Christmas Eve or Christmas Day? Share with me your most beloved Christmas traditions! And now, I leave you with this short video. a tutto il mondo Buon Natale! You've sourced some wonderful photographs here. 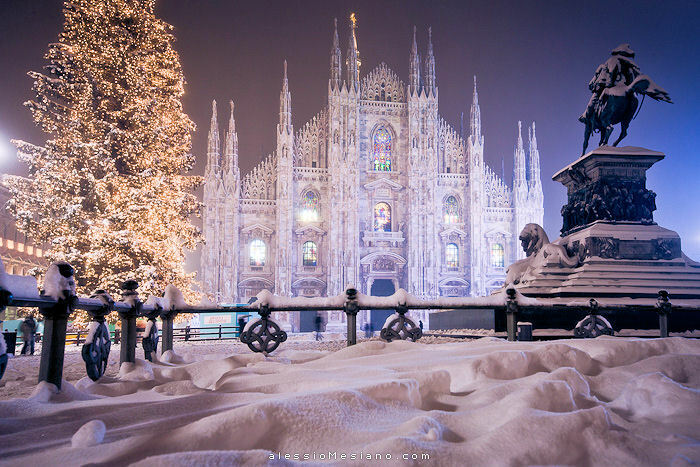 That snowy shot of Milan is stunning. Makes me long to visit Italy at Christmas but which city or village to choose!?! I've never heard of the good Christmas witch so I'm looking forward to finding our more about that. Thank you so much Kathryn..I wish I could have taken most of these...especially Milan and Florence! I agree, quite stunning indeed! 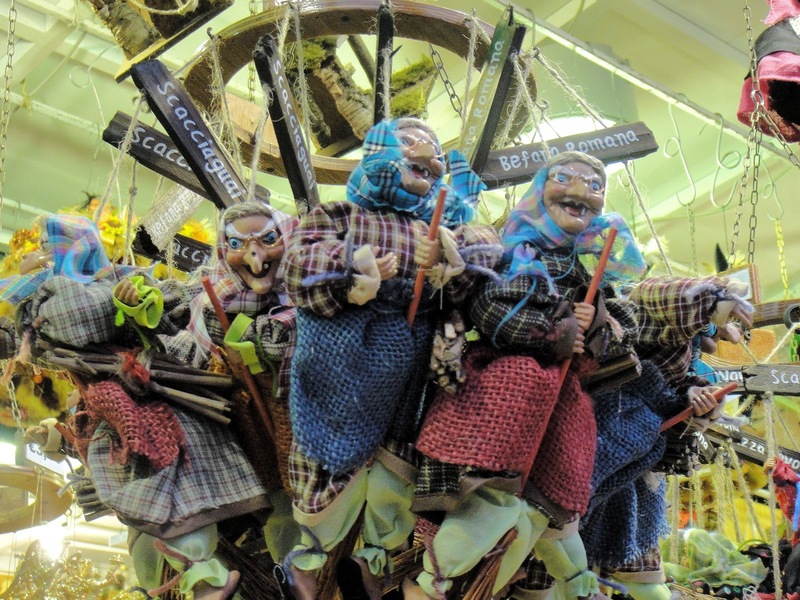 La Befana is big in Rome so you will just need to visit there next year! Thank you so much for stopping by to to share your thoughts and compliments! Great Article, Jeff, a nice overview. I love Christmas here in Rome, but I also enjoy visiting the little shops in Napoli, as you mentioned as well. Buone Feste! Buon Natale Rick and thanks so much for stopping by and for your kind words...they mean a lot coming from someone who loves Christmas in Rome! Thank you again. I have become a huge fan of the Christmas Markets after last winter in Prague. I love the idea of the Christmas Eve bonfire....sounds like a great way to celebrate with friends, family and community. Thanks for the look into Christmas Traditions in Italy - very interesting to see the overlap from home as well as the differences! Hi there Anita. I couldn't agree with you more on all of your points above. With so many traditions and customs, it's hard to ignore that Italians really know how to celebrate the entire holiday season! Thank you so much for stopping by to share holiday experiences and wishes...I like the bonfires too! Hi there Raul and Happy New Year! Would love to hear more about your traditions in Latin America. It's funny how they transcend boundaries, assume local "flavor" and are celebrated by all! Thank you so much for stopping by to share your own traditions and for you kind words! Hi there Sofia and mille grazie for the wonderful compliments. I am really glad you enjoyed this article don't you worry, more great content to come in 2013!! Thx for stopping by and a very Happy New Year to you! Hi there Sue and thanks so much for stopping by and for your kind compliments! I had a great time exploring all of these traditions and my interviews were so enlightening as well! Never heard of La Befana until I wrote this! Happy New Year! Hi there Sue. I can't find you on Twitter but thank you so much for stopping by and sharing your experiences! It must have been enchanting to grow up with even more stories and traditions around the holidays! Thanks again! Greetings Ambra and thank you so much for stopping by to share you Christmas traditions. I too live in warm climate but I miss the winter nights when the snow falls and all is silent in the world! I just checked out your blog and love it especially the Turkey cupcakes! Adorable really! Great article Jeff, thank you! Interesting tips! Hi there Janna and thank you so much for stopping by and for your kind words! Wonderful pics of Christmas in Italy. The Milan Cathedral is magnificent, quite magical in the snow. Hi there Lyn! I couldn't agree with you more, the snow-laden Milan Duomo is magnificent! Glad you enjoyed the post and thanks for the lovely compliments too!